If you’re moderately familiar with the art of solvent extraction, then you’re well aware that the practice is not without inherent danger, even when at the skilled hands of an experienced technician well-versed in safety protocols and execution. Butane leaks, when exposed to a source of ignition, have a destructive, and sometimes deadly impact. The structure of the human body is no fair match for extreme heat packed with a blast pressure punch. That’s an experience to which cannabis author, activist, and consultant Joshua Sheets can confidently attest firsthand. Joshua is a Washington state native, but in June 2017 he was in Grass Valley, assisting several cannabis companies in transitioning from the medical sector to recreational when he became a near casualty in a BHO laboratory explosion. The close-proximity exposure to blast compression married with temperatures in excess of 1300°f incinerated 85 percent of Joshua’s skin. He sustained injuries so severe his chance of surviving the incident were nearly non-existent. His medical team delivered a grim prognosis: a 99.9 percent chance of fatality. One medically induced coma and fourteen skin grafts later, Josh is proving it’s possible to defy the odds when you’ve got skin in the game. And he does. With nearly 20 years invested in the cannabis community and the risk that is intrinsically connected to it. Nearly one year to the day of the incident, we arranged to meet in the parking lot of his surgeon’s office to take photographs of his injuries. He humbly extended his forearms and hands in front of him, rotating his palms upright to show me his injuries, then proceeded to lift his shirt above his head, baring his new shell- an interlaced web of kaleidoscopic scar tissue. It’s amazing what the human body (and spirit) can endure. Unfortunately, physical and mental rehabilitation isn’t the only hurdle Joshua is facing. Under California’s Health and Safety Code 11379.6, producing cannabis concentrates by chemical extraction using a chemical such as butane is a felony punishable by a fine of up to $50,000 and a seven year sentence to a state prison. Originally enacted to target clandestine labs producing illicit drugs such as methamphetamines and PCP, the law ultimately increased criminal penalties for those who illegally manufacture controlled substances with the use of hazardous chemicals. That means cannabis solvent extraction falls within those perimeters. Despite proof of a serious medical condition and being a legally registered medical marijuana patient in both California and Washington, the Nevada County prosecutor’s office and sheriff’s department issued an arrest warrant for Joshua in connection with the blast for the misdemeanor offense of cultivating marijuana and a felony offense of manufacturing a controlled substance, a crime which, if convicted, could mean facing up to seven years in prison. Due to sensitive nature and extent of Joshua’s injuries and subsequent disabilities, going to prison ultimately means limited healthcare and a roll of the dice with his health and recovery. Tell us about your professional background in cannabis. You’re an author and an activist. Can you tell us a bit about some of your past projects? I graduated from Peninsula College on the President's list. I was a paid teacher’s aide in the Horticultural Sciences Department for two years. I also wrote Homegrown Marijuana, the first marijuana gardening book published by a major gardening book publisher. As a nurseryman in Washington, I've run facilities from a 50-foot greenhouse to 17-acres with 14 greenhouses and 100,000 sq. ft. of space. During the medical marijuana years I ran a consultation team for dispensaries that offered full services from seeds or clones of popular or house strains to IPM, trim crews and harvesters that would work on-site, and even a rolodex of south sound dispensaries eager for the medicine. I have over 20 years of cropping out clandestine gardens and fields on public, private, and military land. Greenhouses, atriums, a yurt one time, and backyards. Warehouses, pump houses, basements, spare rooms and closets. I must admit that all the excitement and drama of the green rush was fun, but I had the most fun helping patients at the farmer’s markets. During that period, the farmers, extractors, and the patients could interact freely. There's nothing like signing a book and several months later seeing the look on a happy patient or grower’s face! Huge sticky hydro nuggets tend to produce smiles all around. I was the producer processor behind "the outlaw chef" moniker and was featured in Dope Magazine’s first entry in "Concentrate of the Month" for our Jelly hash line. I've also spoken as a resident expert and patient advocate at the Capital, The Department of Health, The Liquor and Cannabis Control Board, and at events such as HempFest. What's your experience in cannabis extraction and how did you get started? I have a neurological condition called trigeminal neuralgia that causes both chronic and severe acute pain. To treat this adequately, I really needed a more standard form to properly dose and not be blazing all day. I found a copy of Ed Rosenthal’s book Trash to Stash and it explicitly said never to use butane to extract. I had to know why somebody would risk using a solvent, thus began my love affair with BHO. I've been extracting for 13 years now, cranking out dabs of all kinds: hydrocarbon, any type of system open first then closed, from scraping sugar to flipping slabs. I’ve been at it a long time. Don’t get me started on my whip game or waxes. Subcritical extractions, distillate, and diamonds. At the end of the day it’s quality, taste, and clarity that get my attention. What details can you recall from the day of the explosion? It was 110 degrees outside the lab that day. I had been helping some local start-ups get MS and PTSD specific concentrates from the farmers in the hills to the vendors in the cities. At the time, there wasn't much in the way of shatter in the Sacramento or Oakland areas. The lab was on overtime to fill the demand. Somewhere between the heat, the large runs back to back, and the super cold equipment there was a failure. I want to stress that safety should always be of the utmost importance but extracting, like many jobs, can pose inherent risks. I remember the sound of the ignition was deafening as 85% of my skin was instantly burned to the 3rd degree. The smell of my hair vaporizing and my own flesh cooked to well done filled my nose as I was lifted off the ground and thrown out into the night. Quickly, I put myself out and fought the fire- saving what I could of the product and lab. My phone had been destroyed so I went to call 911 at a neighboring property. At first, the neighbors didn't want to answer, but luckily they had a change of heart and we called 911. They used a hose to sprinkle water on me. When the first responders arrived, I helped them by identifying the fire dangers nearby. Within 30 minutes I was on my way to the UC Davis burn unit via medivac. What has recovery been like for you? What has been the most difficult part of recovery? Can you describe what you've had to experience physically and emotionally? The recovery is a mixed bag. Most of the process in nightmarish but you get to celebrate things like your first bite and first step so it has its rewards. 99% of burn patients with injuries of this magnitude do not survive. My lungs and subsequently my heart failed. I was put life support and any unburnt skin except my groin and face was harvested. A suit of corpse skin was placed on me to hold me over until my skin could multiply enough to be grafted back on my body. I contracted MRSA from the harvesting or the corpse skin most likely. It attacked my foot and my eyes. I was little more than a blinded brain attached to a body with life support keeping it working. After I stabilized and enough skin had generated to begin the 14 grafts I needed to cover my body I was placed into a medical coma. I'm resistant to paralytic drugs a bit and awoke several times tearing grafts off. The following 3 months were excruciating. I had to get my whole body cleaned and re-bandaged everyday, and all my faculties had to be exercised until they returned. Sight, breathing, touch, then walking, talking, and finally drinking and eating. These are the high points. When you accomplish these things, you realize you have come once step closer. Mentally at this point I was having a hard time. I dropped all narcotics on request and transferred to Harborview Medical Center in Washington via medical flight. My mind was jelly from the near-death experiences, the huge doses of drugs, and the incredible pain. Burns hurt. Here’s a good place to say this process is harder than words can easily explain. I started this journey with a lot more people by my side. It is so gut-wrenching to watch parts of the recovery process and so frustrating to watch a close friend or family hurt so bad that I feel awful about it. If the drugs don't drive you mad, there's the pain. If you navigate from those, you get to soak in the emotion of how much you hurt yourself and those around you. How have your injuries impacted your everyday life? I'm still recovering 15 months later. I healed incredibly quickly too. It’s a long, excruciating process. Right now my eyes are still sensitive to light and I'm in constant pain. Since all my skin is grafted everywhere, I’ve lost a bunch of my surface area to sweat. This makes me get the sensation that I'm burning again all over. When I'm not enduring that I try to stretch because my range of movement has been greatly decreased. To stretch I use a hot shower and natural movements. This process of just rebuilding from a blind head back to myself is hard, but it is what it is. My oxygen levels are reduced, my hands are disfigured, I get bouts of unexplained hypertension, and my apathetic nerve system is fatigued. I'm 100% disabled but with sunglasses on I can garden for up to 2 hours at a time. My hands work enough to extract and write. My mind is sharper than ever and I see 20/20 when it’s not too bright or my eyes aren't leaking like a civ. What lies ahead for your recovery? Are there any further pending surgeries or treatments needed? I'm due for 5 more major grafting procedures. A set of special lenses for my eyes for a time, then the prosthetics and lenses can come out of my eyes. There's not a lot of precedent for treatments in my case sone most people die or are incredibly handicapped after. The physical therapy is barbaric and ridiculous so I rejected it. I diet as my body sees fit but its technically intermittent fasting and whatever I want. mostly meat from a butcher shop so its not full of antibiotics and junk. I really lucked out but I’ll be watching my health closely until curtain call. The pain is intense. Emotionally, it’s a mega load. I’m beginning to understand why people in my type of situation have a ton of problems like addiction, chronic pain issues, mental illness, and even suicide. Being this tough hurts. And your career in cannabis? Any special projects your currently working on or aspire to begin? I'm a contributing editor for Ed Rosenthal and Greg Zeaman's new book Beyond Buds, Next Generation. 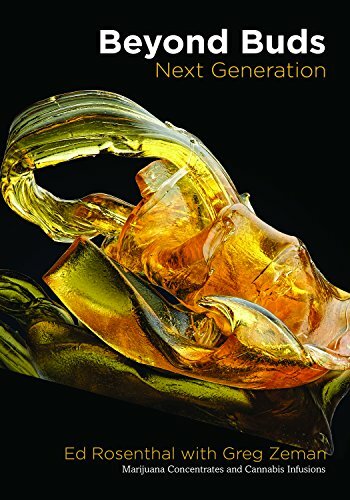 We took a special focus in the book on safety and new extraction and purging techniques. I’m also finishing up another title with Rosenthal called Marijuana Garden Saver. I'm the author and he's the editor on that one. My first book Homegrown Marijuana is available at all major distributors and online through Amazon. The more time passes, the more I heal up. This opens the door to a lot more potential projects. Do you have any advice or words of wisdom you'd like to pass along to others who work in cannabis extraction? Accidents can happen to anyone. Safety first. Don't rush. Wear as much proper protective equipment as you can tolerate. Buy Beyond Buds, Next Generation and read up on all the new tech and safety tips. Do you fear professional criticism or backlash from the industry? I'm pretty well loved and respected. Somebody somewhere will say, "What a dumbass. He blew himself up on accident.” The whole point is I'm not some backyard wook. This can happen to anybody and we clearly state that in BBNG. Gas detectors, properly designed labs, proper protective equipment– it’s how I'm here to tell the tale. Safety is of the utmost importance but it should be known it’s still a dangerous occupation.